At this stage it is clear that the financial system is becoming increasingly distorted and unstable. Perhaps even more so than during the stock market peaks in 2007 or 2000. Those were difficult times for most investors as the euphoria of the boom turned quickly into collapse. Very few people came through the whole cycle well. How well will you do this time around? Is there a better portfolio solution to manage through this remarkable period? At the broadest level it needs to be understood that macro economic policy is stuck in a negative feedback loop. To understand this you only have to look at the two charts below. 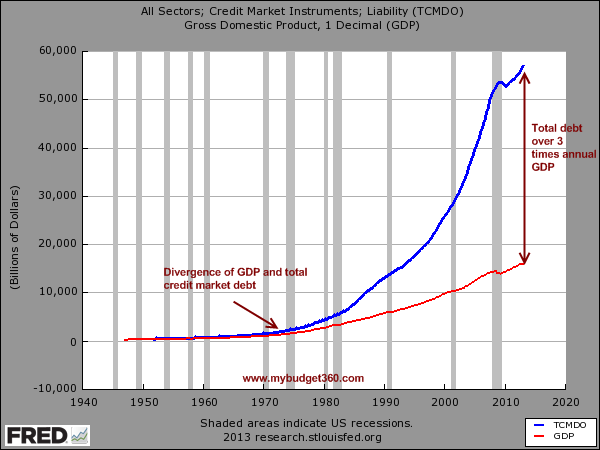 Our policy makers seem to believe that exponential debt creation is a prerequisite for “growth”. 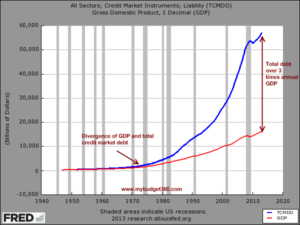 Unfortunately, no one has explained how debt can grow exponentially faster than GDP for ever. The chart below shows what has been going on for the last 40 years. Somehow, 2008 just turned out to be a blip in this progression. My best guess is that this “problem” is understood very well, after all its quite hard to miss. Its just that, as the recent FOMC decision seemed to confirm, no one knows how stop. Still this does leave investors in quite a quandary, especially when incremental debt is boosting growth less and less as debt levels rise higher and higher. Freshly produced debt does produce a sugar shock of temporary growth. However, particularly if it is misallocated, it can be very inefficient and leave a growing legacy of higher debt and interest costs. The longer term impact is the opposite of the short term effect. 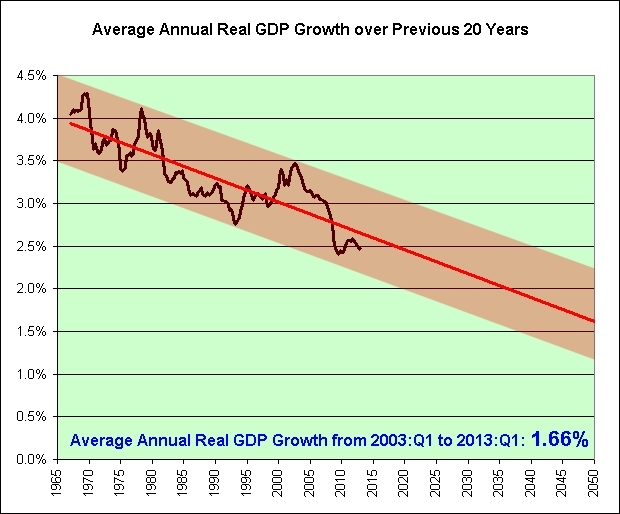 The chart below shows the 40 year growth record. That 40 year period of explosive debt creation has gone alongside a forty year period of steadily declining growth. Is it possible that beyond correlation that there is some causation here? That would not be the wildest economic claim ever made. This is a difficult time for investors. So how do we understand the latest manifestation of the debt supercycle and survive? Have we learnt anything from the last 2 cycles? This shows that the Fed’s stimulus has simply gone straight to the bank’s balance sheets. Their loan books are still the same size as they were in 2008! That money is simply not getting to main street in any meaningful way. This means they have amassed $2.3 Trillion of new “excess” deposits. Do you think they need your deposit? They even receive interest on their deposits at the Fed of 25 basis points. Do you get 25 basis points from your bank? By now its clear that “policy” is not really working for main street. For this to be true you have to believe in the stock market wealth effect, as it seems that this is where the banks are directing the Federal Reserve deposits. This is where the inflation the Federal Reserve is producing has gone so far. Into asset prices, rather than the CPI. However, this idea did not work well when it fuelled the housing boom and bust, over the whole cycle, so it hard to see this working well through the stock market. What often starts out as a seemingly benign outcome at some stage becomes dangerous, and with the volatility we are now seeing we may be getting close to that point. The market has enormous leverage through margin debt, currently at record levels again, which can force selling if the market starts falling. Against this the fuel for further rallies is still there, and the Fed is still pumping QE. There is a clear problem with not stopping QE for fear that something bad could happen. By continuing with these distortions the fragility will only get even more problematic. Perhaps it is easy to understand the human issue. Who would not prefer a problem later, rather than one right now? So where does that leave the investor? With a unique and very difficult set of choices. To define this more clearly, investors can get a better idea of their expected return over the long term, say 10 years, by understanding the very close correlations that have already existed between valuation and average annual nominal return over the immediately following 10 years. John Hussman’s article below strongly suggests that currently the expected annual nominal return in US equities is around 2.9%. About the same as a 10 year Treasury, but with far more risk. If you accept this analysis, owning US equities, broadly defined, is currently as much a speculation as an investment. If you do not get your timing right on further market gains, and when they will end, the downside to normal “end of bear market” valuations is significant. Are you aware of this risk and do you have your sell strategy ready to go? Or do you even want to play this game? Is there a strategy that avoids this or allows you to play this game safely without knowing the timing? Investors really need to understand the investment landscape. It is always great to have good recent returns, but in this environment, this may also represent the level of your risk in a very high risk situation. At some point, those are gains that are highly likely to be lost unless your sell strategy is exceptionally good and works this time around. This is why it really is worth considering how investors can get through the whole the cycle. Not just the latest month, quarter or even year. Is there something that would have worked through the last two boom bust cycles? This is why it pays to study the last page of the fund report below. It shows the record of a fixed allocation going all the way back to December 1982. This allocation made money each year through the whole 2000 cycle. On the way up and then all the way down. It did more or less the same thing through the 2007 bubble. This allocation very rarely does badly. However, when you get to a crack-up boom period it really excels. The high recent volatility, the FOMC’s September decision, current valuations, and yesterday’s minutes, tell us that we are once again entering another crack up boom period. This is why investors need to turn more to the resilient qualities of the “All Weather” portfolio, which is a similar structure to the permanent portfolio. At this stage in the markets this is the allocation that has proven itself above all others. So increasingly this should become the model allocation. To the extent there is a departure from this structure, it is possible to insure that risk with options. At this point it is important to know how far your allocation is from this model and be clear about the risks and the potential return. Unless you do this you are currently taking an enormous risk with your investments. This model is so resilient that a great deal of analysis has gone into it and naturally there are many variations on the theme, but the article below is a good place to start. It compares some basic orthodox strategies with the “All Weather” approach with all the metrics shown over a period of over 40 years. Just visualizing the charts of the different portfolios quickly shows that with only a minor loss of return, there is a massive reduction of risk. The statistics on display reinforce that initial impression. Investors need to think really very carefully about this. How focused they should be on short term performance, and how important it is to understand the broader context of the markets and the economy. It is here that true confidence can be found in their ability to durably surviving another violent market cycle. It is hard to follow an allocation that at times will appear to be “underperforming”, but unless you are really good at timing a market driven by free money on the one hand and over-leverage on the other then this could, at some stage, be a very difficult time and most likely will be for most investors. Understanding the value of the “All Weather” approach can provide enormous benefits far beyond the statistics. A lower volatility portfolio means the pressure on decision making falls. The investor is far less likely to be confronted with tough decisions in a crisis situation following substantial losses. Studies by Dalbar show that most investors tend to overreact following periods of losses, with a high tendency to chase recent good performance. Unfortunately, this is driving by looking at the rear view mirror, with understandably very poor results over time. Don’t focus so much on recent returns. Understand the bigger picture. Don’t be in a hurry to get wealthy. Lower unnecessary volatility and risk that does not improve your long term return. Be constantly in a place where you will be able to take advantage of opportunities when they do arise. From a low risk structure you have confidence in, you will improve your chances of long term prosperity and lower your anxiety. All this is to say that when it comes to execution of your investment strategy, there are multiple benefits to the “All Weather” approach that will likely offset any minor statistical underperformance from static performance analysis.